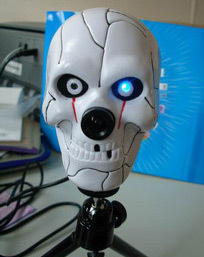 The Chinese manufacturer of this skull-shaped webcam must've gotten its dates mixed up, this being more of a Halloween item than anything else, but what better way to conjure up a menacing mood for a dreaded WebCam meeting than using this SkullCam? Look to its glowing eye for inspiration, and humble yourself in the fact that underneath that skin of yours lies a skull somewhat like this one. What the heck is the point of this, anyway? Next, this manufacturer will release a smiley-faced webcam, just remind you to keep that twinkle in your eye and smile in your voice. Just what we need.